The Society met last week. Well, some of us did. What I had hoped would be the first of many annual symposiums-- showcasing famous guest speakers, tasting in some of our favorite rooms, and of course all of the attendant media flash that we'd have to tolerate-- turned into me and Hamachi eating, drinking, drinking, passing out on porches, beer-nerding, eating, and drinking. The Secret: Entombed somewhere in the back of GG's Prius, beneath the mound of vintage Louis Vuitton garment bags and Filson slings, there was a crumpled paper sack packed with rare and yet-to-be-sampled sardines. It took a week of plying the both of them with strange food, sparkling wine, and dreadlock-smelling weed for Jonny to finally, on the last day, dig around in his tent and invite me aside for a "talk". It's known to all that dude has been holding out for months, but I had no idea the embarrassment of riches that he possesses. Hamachi's people are widely travelled and uber-generous-- He's been stacking up tins like he breaks hearts. Mostly Euro stuff, couple of goodies from Japan. 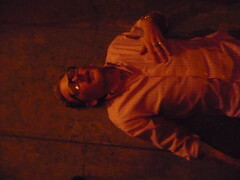 He layed some on me with handshakes. Dropping irreplaceables out of his personal stash. He knows I'm drying up and is trying to jumpstart me on putting down a review or two. No pressure, just like, "Hey man, try these out and let me know what you think..."
If nothing else, these are the first sardines I've seen with the postmodern, minimalist, "Helvetica in a colored line" label. Sort of intriguing in a way-- As if sardines, and the eating of them, may have finally arrived in the 21st century. 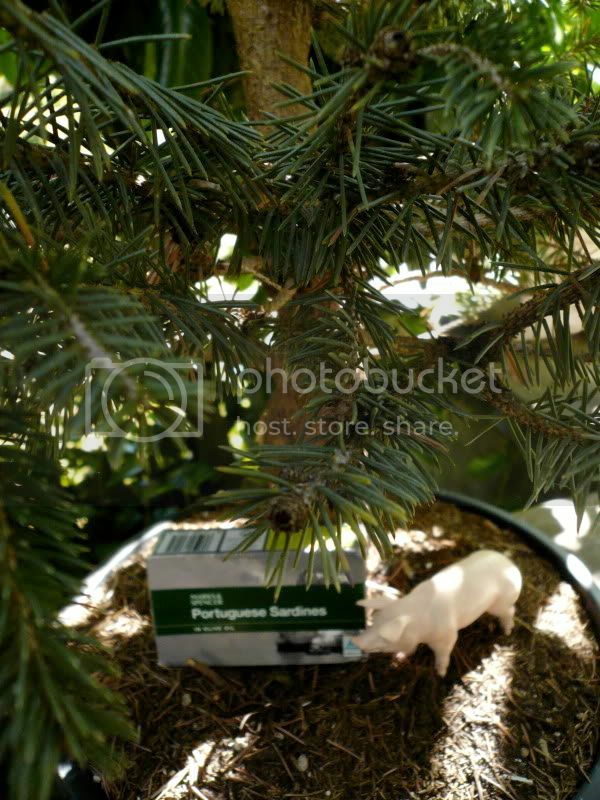 I figured that the least I could do was photograph them outdoors, with a plastic pig. Had a lookee into the website for Marks & Spencer. Seems like kind of a do-all for cheap British yuppies. Wine, hip and inexpensive clothes, furnishings and housewares, other crap. 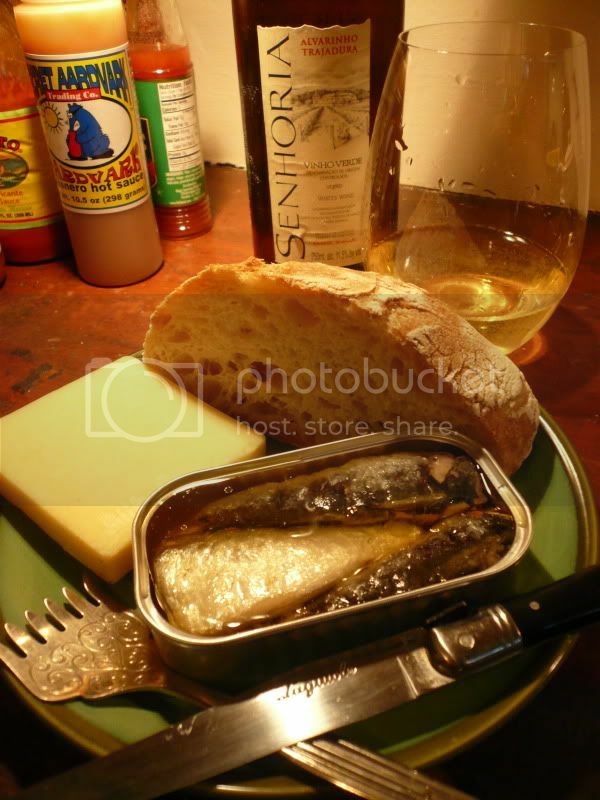 "Our sardines swim in the turbulent, rocky waters off of the Portuguese coast. It improves their muscle texture and gives a firmer and tastier product. Local fishermen have been catching fresh sardines for us for over 20 years. The fish is specially selected from the top of the net to ensure the best quality and delivered to the factory within 4 hours of the catch for maximum freshness"
It's like, informative yet vague all at the same time. Yay! Fishwise, they're damn good. Three big 'uns in a light olive oil. Big spines, pretty skin. They broke apart but were still firm, and I wiped the oil/bone/fish slurry out of the bottom of the can with a crust of bread. If you're not hip to Vinho Verde, get there, Jim. Beautiful Portuguese almost-sparkling. The good ones are $6-$10. Cheap because they come from rustic-assed family vinyards where the vines are grown up high so they don't crowd out the vegetables planted beneath. Should be opened and enjoyed within a year of bottling. I can get behind that. Thanks for the detailed review. Just one correction – In Portuguese it’s “bom” (sounds a bit like the French “bon”) Your “bueno” might just make the grizzled Portuguese guy who netted your fish fly into a rage. Portuguese nationalism is most provoked by confusing them with the Historic Enemy next door! 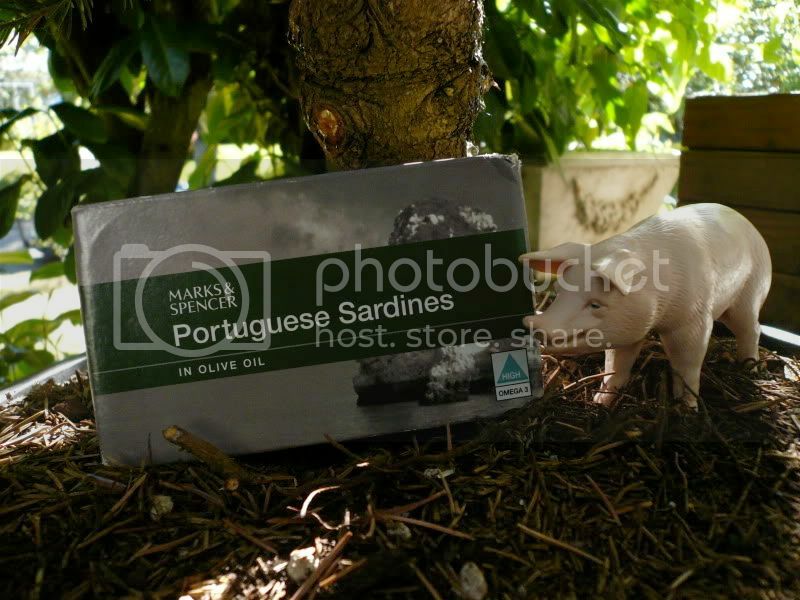 Bizarre marketing -Who knew that Portuguese sardines taste better because they exercise more!? Good choice of wine… and the Pig (Portugal’s other great gastronomic obsession). I have to get me one of those sardine forks. Keep up the good work. That shot of the plate and wine and hot sauce is on the money. So good. Makes me want to pop a tin.